1. Dress the table in your favorite greens! 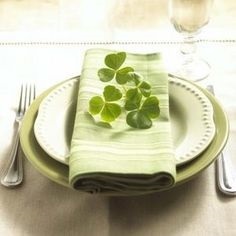 Add a four-leaf clover to the table setting with some twine and fill your centerpiece with succulent greens. 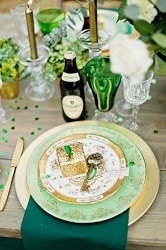 The bright green will catch the eye of all your guests, making for the perfect Irish-themed table scape. 2. A pot of gold. Have small pieces of gold leafed paper set aside for your guest to write down good luck wishes and tips for the newlyweds! These good wishes and words of wisdom will be small tokens you and your groom can cherish for years to come. 3. 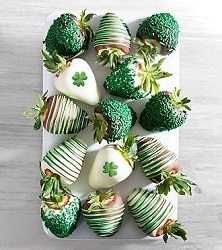 Make your sweet treats have a little “Irish punch.” Green chocolate covered strawberries, Guinness stout cupcakes, Bailey’s milk and cookies… there are so many magically delicious combinations you can do to satisfy your guests’ sweet tooth! 4. Cheer your guests with a send off toast! 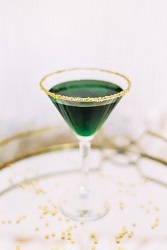 If “Shippin’ Up to Boston” hasn’t played at your St. Patty’s-themed wedding, now’s the perfect time for a last drink and dance with your guests! 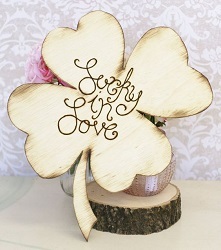 Grab your groom and your Guinness and hit the dance floor because nothing’s richer than Irish love! For more ideas and inspirations, follow us on Pinterest!